Do we Christians always have to forgive? Forgiving others and humbly asking for forgiveness are central disciplines for all Christian believers. Lent, a time to reflect on our Christian journey, is an appropriate time to deepen our understanding and practice of forgiveness. 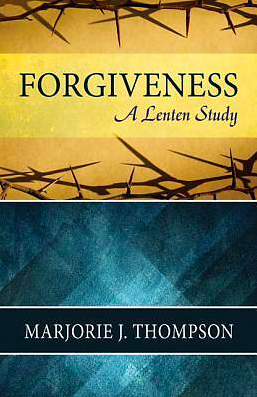 Marjorie J. Thompson, author of the best-selling book Soul Feast, takes a close look at our understanding of forgiveness in this encouraging study. In six brief chapters, Thompson addresses such questions as the following:Is forgiveness a Christian duty under all circumstances? Or are there situations when Christians do not need to forgive? ​Using biblical examples and and real-life situations, Thompson illustrates each chapter's theme in an informative and engaging way. A study guide is also included at the back of the book that is appropriate for either individual reflection or group discussion. With clarity, insight, and sensitivity, this book is the perfect resource for examining both our ability to forgive and our own need for forgiveness. This is a 6-week study that will begin on Wednesday, March 13th at 7 pm. (Potluck supper will be at 6:15. Bring a dish to share!). Sign up below! Books are $10.